It would be rash to conclude that the pigeons who regard General Allende's statue as their home away from home display disrespect for the General in spite of appearances. 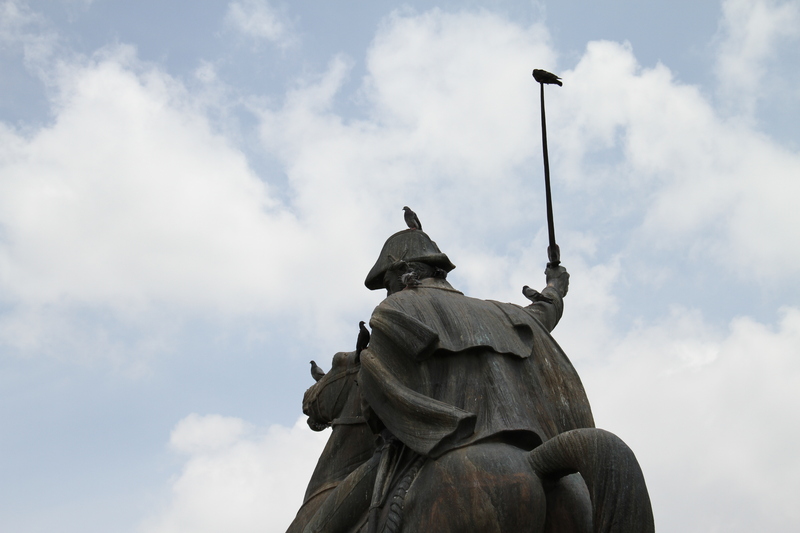 I have given this a good deal of thought while lounging in the Plaza Cívica Ignacio Allende, this business of pigeons perching on statues being the worldwide phenomenon that it is and has been throughout the history of outdoor statuary. For a slideshow and short commentary, you can click here. Vast. Hot. Dusty. Crowded. Chaotic. Impossible to photograph because of those colored, plastic tarpaulins hung for the shade that cast hues. 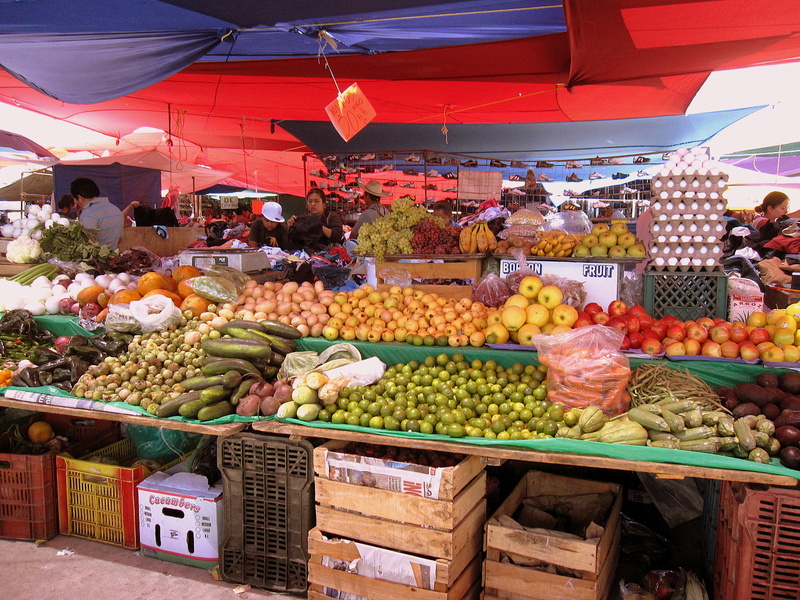 Tianguis de martes. The Tuesday market. My market. Every Tuesday. I love it. I know. I know. This blog has been sludge slow recently. However, not so today. I have a video for you! There are neighborhood fiestas here as well as city-wide fiestas, state-wide fiestas, and national fiestas. Yesterday was the last day of the big neighborhood fiesta of the year here. My neighborhood is called colonia san antonio. Saint Anthony walks the streets here and is a big personality. This was his time, and it lasted all last week. All last week. Every so quiet, ever so peaceful and cool here right now. Finally, it rains. It remains to be seen how much. If you are interested in reading more about this, you can click here. If you click on the photo, you will see that it is a cemetery, un panteón in Spanish. The fact that I am in a place as nearly perfect for me as perfect can be in this world, and in the best time of my life, does not prevent me from complaining about this or that detail. The pizza delivery guys screaming through the streets on motorcycles here are more than a detail, however. Someone made this and posted it on youtube, probably in aid of the tourist industry in Puerto Vallarta. Even though the boys have a little trouble pronouncing "Juarez," nevertheless it is clever, I thought. And in addition if you would like to see another video of the song done with real children, then you should click here. Arboreal Coexistence . . .
. . . in San Miguel de Allende. Early Friday morning before daybreak, I picked up the French Canadian maniac, Michel, at his house. We drove off hoping to take some decent photographs in the early morning light, which is quite different than the light when the sun is directly overhead. That little weather gadget over on the right on this page is actually reporting the temperature in Guanajuato, the capital city of this state. Guanajuato is about an hour's drive away and a bit lower in altitude. For my friends and family the green folks run a little weather station right outside of town. If you will click here, you will see their web site with the local weather accurate for San Miguel. In the meantime here is a leisurely video report on the weather. After that is the essay on cross-checked corn fields that I wrote for some city folks.